Marco Verratti dismissed Paris Saint-Germain’s Champions League defeat to Manchester United as nothing more than a fluke. Thomas Tuchel’s men spectacularly blew a 2-0 aggregate lead to lose the return leg of their last-16 tie at home to United 3-1 and exit the competition on away goals. 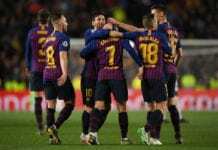 It marks PSG’s third successive defeat at that stage of the competition, which raises concerns over where the French giants are going. The club’s president, Nasser Al-Khelaifi, has already dug deep into his pockets and splashed out €402m on signing Neymar and Kylian Mbappe over the last two years. But Verratti is convinced they are heading in the right direction and pointed out that PSG would have beaten United “nine times out of 10”. “Maybe I’m more frustrated than others, but football is like that,” The Italian told Telefoot. “We can’t have everything. “The fans are disappointed by the elimination. I’m confident in this team. This match, if we played it 10 times, we would win nine. The loss of Neymar to a foot injury undoubtedly didn’t help matters for PSG against United. However, Verratti is hopeful the Brazilian will be back before the end of the season even though they are no longer in the Champions League. “I have the impression that he never stopped. He hoped that we would go into the quarter-finals so he could help us there,” said Verratti. “We could not give him this gift. I hope he will come back soon to help us. Neymar returned to training this month and is seemingly set to remain in France for next season, despite the persistent rumours linking him with a return to La Liga at either Real Madrid or old club Barcelona.